On September 20, 2016, the 17th edition of BIFF starts in Norway, hosting also a vast section of international creative documentaries. Within the mutual cooperation, KineDok will offer four screenings of three creative documentaries to the Norwegian audience, which had been screened within the project in the Czech Republic, Poland, Hungary, Croatia, Romania and Slovakia so far. “Three documentaries that belong to the most successful films of KineDok’s second edition will be introduced at the festival. Their qualities have been proved not only by several awards from international festivals but also by the great interest of the audiences in all countries where we have screened them,“ says the project manager of KineDok Jana Ripplová. 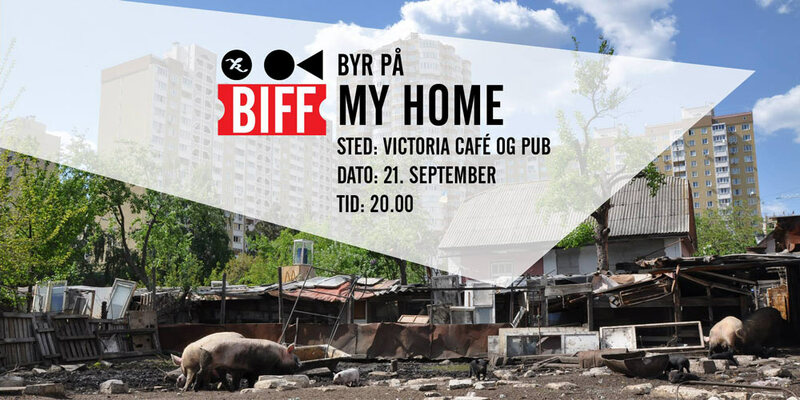 In Bergen, the audience will thus have a chance to watch for example the story of vigorous Natasha who lives in the middle of a housing estate in Kiev with her two husbands, four kids, and a herd of goats and pigs, trying to protect her cabin against the developers and her family against the Jehovah’s Witnesses. Her story was made into a documentary called My Home and has already won the Audience Award at Docudays Ukraine and a special mention at goEast in Germany. Another documentary on KineDok’s programme will be the successful Polish documentary 6 Degrees inspired by Milgram's Six degrees of separation theory with its assumption that every person in the world can be reached through 6 personal connections. The crew tries to explore the chain of connections between two randomly drawn protagonists: Martyna - a young punk-rock musician from Warsaw and Marco Antonio - a farmer from little village in Mexico. The director Bartosz Dombrowski discussed his film with the audience in person at several previous screenings. You can read an interview with him here. The third KineDok documentary that is going to be presented in Bergen is multi-award winning German-Polish film Domino Effect that celebrated successes at many prestigious film festivals (e.g. DOK Leipzig, Visions du Réel in Nyon, Krakow Film Festival, Kosovo, Jerevan). This formally elaborate film about the relationship between the Abkhazian Minister of Sports, Rafael Ampar, and his newlywed Russian wife Natasha, takes place on the background of the VIII. World Domino Championship, set in the backdrop of the devastated Abkhazia, where - despite the Russian promises - almost nothing works properly. The renowned Polish director Piotr Rosolowski and the documentarist Elwira Niewiera spent more than three years working on the film also within the Ex Oriente Film workshop. You can find the interview with its creators here. The documentary Bear Island filmed by three brothers during a surf trip on one of the coldest islands on earth: Bear Island and a contrasting film Siblings Are Forever as a poetic exploration of the peaceful coexistence of Magnar and Oddny, two siblings, who take care of the family farm truthful to the traditional ways of their ancestors, closely entwined with the grandiose natural surroundings. “We see the cooperation with BIFF as another step towards the promotion and support of the creative documentary production. KineDok organizes site-specific screenings at more than 150 places in 7 countries in 2016, invites directors and interesting guests for discussions and aims to enrich the cultural offer in the region. We appreciate every single viewer coming to the screening and we are grateful for the support from all screening places, directors, filmmakers and guests who take part in the discussions after the screenings”, says Jana Ripplová.